Most of us don't think too much about our mortgage lender once we've moved into our new home. We might complain about how much interest we're paying on our mortgage each month, but that's about as deep as it gets. This attitude, though, could be costing you money. Your mortgage payment probably ranks as your biggest monthly expense. So why wouldn't you reach out to your lender, at least occasionally, to see if you can somehow reduce it? It makes sense to contact your mortgage lender at least once a year to ask about lowering your interest rate, adjusting the term of your loan, or maybe even refinancing into a different loan type. Doing so could save you a significant amount of money each year. Here are five questions you should call and ask your mortgage lender each year. 1. Is there a way to lower your monthly payment? Mortgage interest rates have been rising since the middle of 2017. But this doesn't mean that the rate you have with your mortgage loan now is as low as it can ever be. If you applied for your mortgage five or more years ago, was it at a time when you were saddled with thousands of dollars of credit card debt? Did you have late or missed payments on your credit reports? If your financial situation has improved since then, you might now qualify for a lower interest rate. And that lower rate will save you money on your monthly payment. Consider this math: Say you are paying off a $200,000 30-year, fixed-rate mortgage with an interest rate of 5.25 percent. Your monthly payment, not including taxes and homeowners' insurance, will be about $1,104. If you now owe $180,000 on that same loan, moving to an interest rate of 4.25 percent would knock your monthly payment — again, not including taxes and insurance — down to about $885 a month. That's a savings of about $219 a month. 2. Can you refinance to a shorter loan? Refinancing isn't just a way to lower your monthly mortgage payment. You can also reduce the amount of interest you will pay over the life of your loan. It's no secret that a good chunk of your monthly mortgage payment goes toward interest. If you are paying off a $200,000 30-year, fixed-rate mortgage with an interest rate of 4.25 percent, you'll pay more than $154,000 in interest if you take the full three decades to pay off that loan. But if you refinance to a shorter-term loan, you can dramatically reduce the interest you pay over the life of your loan. Say you owe $185,000 on that same loan. If you refinance to a 15-year, fixed-rate loan with an interest rate of 3.8 percent, you'll now pay just more than $57,000 if you take the full 15 years to pay off the loan. Just be aware that because your loan term is shorter, your monthly payment will be higher. 3. Can you pay more toward the principal? Refinancing does come with financial rewards. But it's also costly and time-consuming. If you can't drop your interest rate by enough, you won't reap enough monthly savings anyway. But there is a way to reduce the amount of interest you'll pay over the life of your loan and shorten the number of years it will take you to pay it off: You can pay a bit extra with each mortgage payment. Say you have 25 years remaining on a 30-year, fixed-rate mortgage loan of $200,000 with an interest rate of 4.5 percent. If you pay an extra $100 toward your loan's principal balance each month, you can reduce the time it takes you to pay off that loan by three years and nine months. You can also save nearly $21,000 in interest payments over the life of the mortgage. 4. Is it time to move to a steadier mortgage type? You might be paying off an adjustable-rate mortgage. As the name suggests, the interest rate with such mortgages doesn't remain fixed, but instead adjusts according to whatever economic index your loan is tied to on a regular schedule. Most adjustable-rate mortgages, better known as ARMs, start with a fixed period of five to seven years during which your rate won't change. After that fixed period ends, your rate will adjust on a regular schedule, usually once every year or once every two or five years, depending on the type of ARM you are paying off. The attraction of ARMs is that you often start with an interest rate that is lower than what you'd get with a more traditional fixed-rate mortgage. The risk is that when that rate adjusts, it could rise far higher, bumping your monthly mortgage payments up with it. 5. Can you make your monthly loan payments less of a burden? Are you struggling to make your monthly mortgage payments on time? Are you worried that you won't be able to make your payment next month? 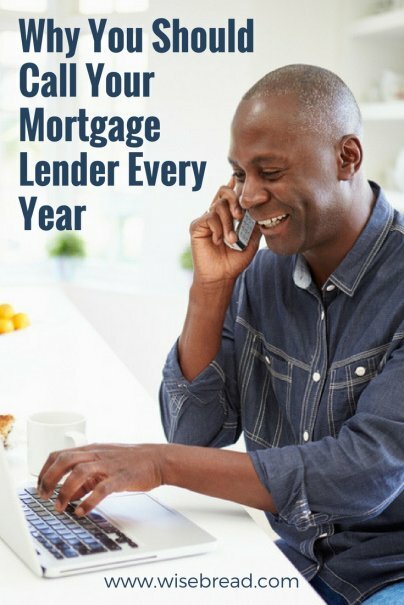 Then it's definitely time to call your lender. Your lender, for instance, might be willing to reduce your interest rate temporarily or lengthen the term of your loan so that your monthly payment is lower. Be prepared to prove to your lender that you can no longer afford your monthly mortgage payments. If you've lost your job, show the paperwork proving it. If you've taken a pay cut, send your new paystubs.